Style & Culture: Too Fat? At 5'10" and 120 pounds, model Filippa Hamilton says she was fired by Ralph Lauren for not fitting into the clothes. Hamilton, who is 23, has been working as a model for the label since she was 15 years old. She says that she was very angry about her firing and the release of a picture of her angered her to the point she's speaking out. 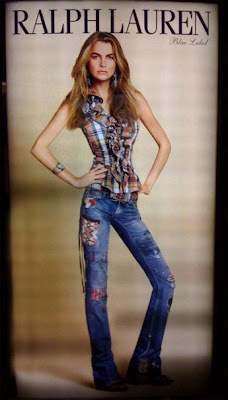 The recent image of her in a Ralph Lauren campaign appeared with a severely distorted image of her. Hamilton's head appears so much larger than her pelvis. Her waist is so small it looks cartoon-ish. The company has since made a statement regarding the matter saying, "For over 42 years we have built a brand based on quality and integrity. After further investigation, we have learned that we are responsible for the poor imaging and retouching that resulted in a very distorted image of a woman's body. We have addressed the problem and going forward will take every precaution to ensure that the caliber of our artwork represents our brand appropriately." Even so, the fashion industry has come under much criticism for years regarding the shrinking size of models. It not only poses a severe danger to women having negative images about themselves but it also creates a huge stress for the models themselves. They are forced to do whatever possible in order to fit into sample sizes. Designers typically have made sample sizes in size 4-6 but in recent years it has gone down to a small as size 2; making it harder for the models to lose the weight. In most cases they fear losing a job if they don't fit the clothes. Take a look at the photo. What's your take on this. I'd love to hear your comments.